'S è aoigh na seachdain-sa, Derek Mac an Tòisich, air am bheil na Gàidheil eòlach mar neach-aithris telebhisein. Gaelic TV presenter Derek Mackintosh from Solas, North Uist. Dà uair a thìde de shàr cheòl is còmhradh còmhla ri Iain Mac 'ille Mhìcheil, a' craoladh beò à stiùdio a' BhBC ann an Glaschu. An t-seachdain-sa, bìdh Iain a' cur fàilt' air Derek Mac an Tòisich, craoladair òg à sgìre Sholais, an Uibhist a Tuath. Na òige, bha ùidh mhòr aig Derek ann an spòrs agus dràma. Bha e soirbheachail aig Geamaichean Uibhist, agus farpaisean eile air tìr mòr. Na dheugaire, fhuair e prìomh phàirt anns an dràma telebhisein Balaich Rònaigh. Aig aois 17, sheinn e an t-òran Gillean Uibhist le bàrd eile à Uibhist a Tuath, Calum Camshron. Fhuair Derek a' chiad duais, ga ghabhail aig a' Mhòd Nàiseanta Rìoghail. Chaidh e gu colaiste Sabhal Mòr Ostaig às dèidh dha an sgoil fhàgail, far an do chuir e eòlas air na meadhanan Gàidhlig. Chuir e seachad faisg air bliadhna a' trèanadh aig STV ann an Glaschu, ag aithris air prògraman airson clann fo aois sgoile. Tha Derek an-diugh a' fuireach ann an Glaschu, far a bheil e fhathast an sàs ann am prògraman chloinne aig a' BhBC. Cluinnidh sinn a chuid sheanchas, agus ceithir de na roghainnean ciùil pearsanta aige. A bharrachd air a sin, bìth measgachadh math de cheòl air a thaghadh le Iain fhèin dhuinn, a' gabhail a-steach cuid de na guthan 'Country' is fheàrr a th'ann. 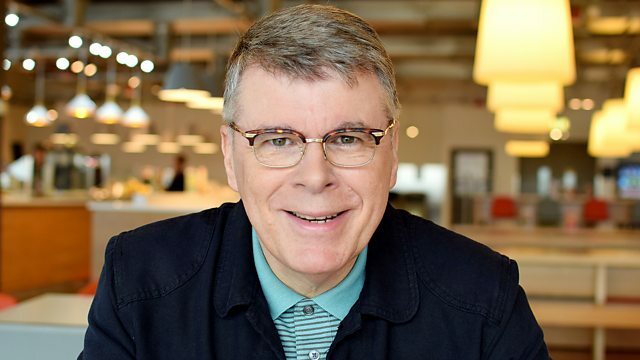 Two hours of chat and music with John Carmichael broadcasting LIVE from the BBC studios in Glasgow. John welcomes Derek MacIntosh, formerly from North uist who now lives and works in Glasgow. Derek's career has been shaped by his interests in drama from a young age. He has won prizes for Gaelic singing and currently works in Gaelic broadcasting on children's programmes. During the show he will reveal his 4 favourite pieces of music which will complement John's own playlist of exceptional music including Celtic and country and western songs. BEST OF NEW GRASS REVIVAL. Gentle Giants: The Songs of Don Williams. THAT'S THE WAY LIFE GOES. So You Wanna Be An Outlaw.